49ers vs Vikings. Monday night football. A lot of people have been asking me about the low-light capabilities of the new iPhone 6s. I had the opportunity to shoot last Monday night's football game with just my iPhone's. Both the 6s and 6s Plus. Sports and a wide angle is a tough one, but being close on the sidelines for a screen pass helps. Honestly this camera is better than the last, and I'm thankful that Apple gave me the honor and opportunity to try the new iPhone out before the public release. 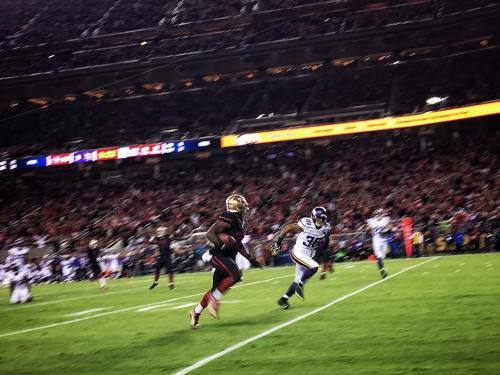 #photojournalism #documentary #reportage #sports #sportsphotography #sanfrancisco #sanfrancisco49ers #49ers #football #minnesota #minnesotavikings #vikings #iphone6splus #iphone6s #mondaynightfootball" By benlowy on Instagram.